Speaking in the garden of the Raffles Hotel on Tuesday afternoon, U.S. Secretary of State John Kerry said the “urgent challenge” of countering extremism, building business ties and seeing Cambodia become a thriving democracy were at the top of his agenda during his daylong visit to Phnom Penh. 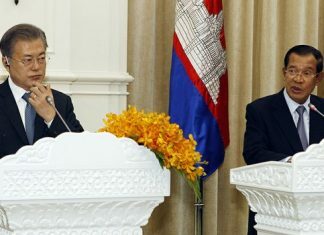 In remarks following his talks with Mr. Namhong and again in his address in the afternoon, Mr. Kerry said that bringing Cambodia into the fold in the fight against the Islamic State group was a priority for the U.S.
“Today I also discussed with the Prime Minister the urgent challenge internationally of countering violent extremism. And we agreed that this is absolutely a top priority in the relationship between any country today,” Mr. Kerry said in his afternoon address. “The prime minister expressed a deep interest in Cambodia working with our counter-Daesh coalition,” Mr. Kerry said, using a term for I.S. derived from its Arabic spelling. “He expressed an interest in having our teams, our experts, come in order to brief and exchange ideas, and we agreed to that,” he said, adding that the summit in Sunnylands would provide an opportunity for the assembled leaders to have an “in-depth dialogue” on the topic. Civil society groups sent Mr. Kerry an open letter this week urging him to address a litany of human rights abuses in Cambodia and a recent offensive against the political opposition during his meeting with Mr. Hun Sen.
“I made it clear also in my meetings today that it is our hope—I think it’s a global hope—that Cambodia will realize the full benefits of a thriving, multiparty democracy,” he said. 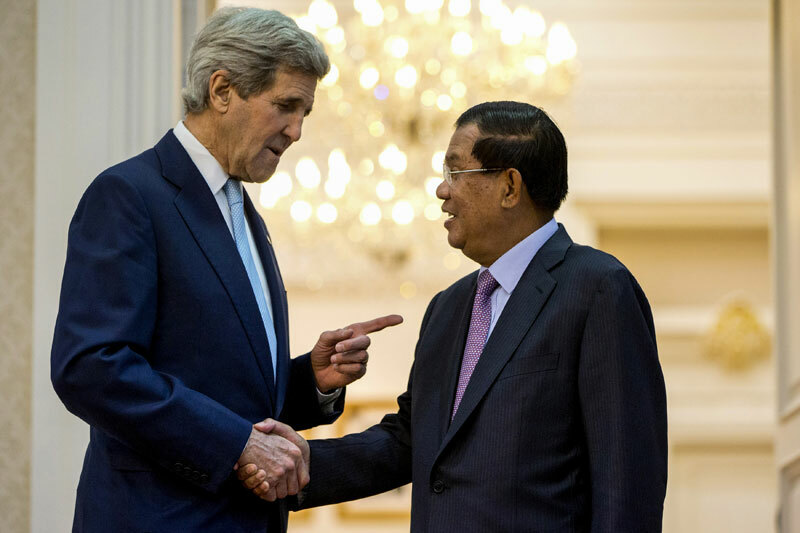 In an apparent reference to the October beatings of opposition lawmakers Nhay Chamroeun and Kong Saphea, Mr. Kerry said ensuring the safety of lawmakers was “a fundamental responsibility” of the government. “Democratic governments have a responsibility to ensure that all elected representatives are free to perform their responsibilities without fear of attack or arrest,” he said. Earlier in the afternoon, Mr. Kerry met with a delegation of senior opposition officials, including deputy opposition leader Kem Soha, and held a separate meeting with local civil society leaders. 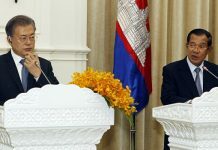 “In every meeting, I made clear that we are committed—we the United States of America are committed—to the relationship between our country and Cambodia,” he said. The secretary of state, who visited Cambodia numerous times as a U.S. senator in the 1990s, noted during his afternoon address the country’s rapid development since he was last here and the desire of the U.S. to strengthen economic relations. Mr. Kerry said it was “actually quite remarkable” that the U.S. remained Cambodia’s top export market. “And we will continue to explore ways to deepen our trade and investment relationship including by helping to tackle corruption and exploring ways to strengthen Cambodia’s legal institutions,” he said. Unlike former U.S. Secretary of State Hillary Clinton, who hosted a public discussion with hundreds of students during her visit to Cambodia in 2010, Mr. Kerry did not avail himself to any public questions, and his meetings were closed to the press. Mr. Namhong, the foreign minister, also highlighted the importance of cooperation in the fight against I.S. in remarks following his meeting with Mr. Kerry. And despite the tension between the U.S. and China over claims in the South China Sea, and wider competition between the superpowers for influence in the region, Mr. Namhong said Mr. Kerry did not push Cambodia on issues related to China. Cambodia has come under heavy criticism for being perceived as siding with China in its territorial disputes with a number of Asean countries in the South China Sea. During Mr. Kerry’s discussion with Mr. Hun Sen, the prime minister requested continued U.S. support in the “health sector, education section, mine clearing,” according to his personal assistant, Eang Sophalleth, who briefed reporters after the meeting. 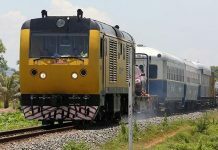 Mr. Hun Sen also expressed his desire for the U.S. to consider “letting Cambodia export goods to the U.S. without quotas or tax, factors that will help to push Cambodia’s development,” Mr. Sophalleth said.